You can get rid of those ugly black rings under your eyes by properly following some easy natural home remedies for Dark Circles under eyes. Home treatment for Dark Eye Circles consist of inexpensive and safe natural cures to heal this common problem. More often than not, Dark Circles are caused by hereditary factors that encourage weakening of capillaries on skin around your eyes. Besides, factors like skin tone and transparency level of the skin make Dark Circles appear even darker. Dark under eye circles become worse due to sun exposure as it increases the amount of melanin in the skin. Anemia, old age, stress, fatigue, poor circulation and lack of sleep also contribute in causing Dark Circles. Issues like Eczema and Allergies make you rub your eyes repeatedly, thereby breaking small capillaries beneath the eyes and hence causing discoloration under eyes. Besides, increased water retention in the body due to thyroid disease, kidney disease, or intake of birth control pills etc tends to aggravate black rings under eyes by causing dilation in the blood vessels. Habit of cigarette smoking also enhances this common problem. 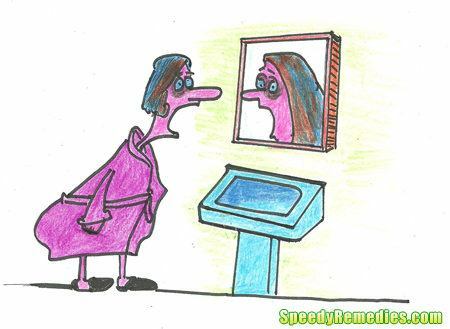 In women, pre existing Dark Circles are likely to become worse during menstruation and pregnancy. Completely removing Dark Circles is definitely not easy. Still, you can use certain therapeutic natural remedies for Dark Circles under eyes to make these black rings disappear considerably. Keep in mind that Dark Circles natural treatment is sure to give encouraging results when you consistently follow these natural cures. • Placing cold tea bags under eyes for about 15 minutes is one of the most widely used natural home remedies for Dark Circles under eyes. It also helps reduce under eye puffiness. Usually, green tea, rosemary tea and chamomile tea bags are used to get rid of these problems. • Similarly, you can also use cold compresses or ice cubes wrapped in soft cloth to constrict dilated blood vessels and hence reduce Dark Circles under eyes. • Mix about one tablespoon of honey, three tablespoons of orange juice and some gram flour, just enough to prepare a paste. Finally, let the mixture cool in the refrigerator for sometime and then apply it around your eyes as an effective Dark Circles home remedy. • Placing cucumber or potato slices on the eyes is one of the most popular natural home remedies for Dark Circles under eyes. You can also use a mixture of cucumber and potato juice in equal quantities and apply it with the help of a cotton ball for about 15-20 minutes. Then, rinse the area with warm water and apply a cream. • As parsley is useful in lightening Dark Skin under eyes, you can freeze a few parsley leaves in water and place these parsley cubes under your eyes. • Add a teaspoon of tomato juice, half a teaspoon of lemon juice and a pinch of turmeric powder in some orange lentil flour to form a paste. Next, apply this paste around your eyes regularly for about 10-15 minutes to heal Dark Circles under eyes. Or, simply apply a combination of lemon juice and tomato juice (or cucumber juice) mixed in equal parts to fade Dark Circles. Follow this procedure two times in a day. You can also place some crushed mint leaves on the black rings. • Drinking a combination of tomato juice, lemon juice, mint leaves and salt helps reduce Dark Circles under eyes. • Applying a paste prepared from one teaspoon of pineapple juice and some turmeric powder serves as a valuable natural cure for Dark Circles under eyes. You can also use a mixture of one tablespoon each of honey and turmeric powder to reduce dark eye circles by improving circulation. • Soak a cotton ball in some rose water and apply it on the affected for 3-5 minutes is beneficial in removing Dark Circles naturally. • Regularly massaging area around the eyes with almond is one of the most highly recommended Dark Circles home remedies. Follow this therapy at night before going to sleep for at least two weeks. You can place use alternate hot and cold compresses around eyes before massaging. • Another valuable Dark Circles natural remedy with almonds involves the use of a mixture of almond paste prepared by soaking a few almonds in water overnight and then grinding them in the morning to form a paste. Next, add some drops of raw milk in it and then apply the resultant paste on the affected area for ten minutes. Combination of nutmeg and milk also helps remove Dark Circles under eyes. • Gently massaging the under eye circles with castor oil and then leaving it on skin overnight is a useful herbal cure for Dark Circles natural treatment. Do not forget to wash it off in the morning. Follow this therapy on a regular basis. • Acupuncture, acupressure, yoga, eye exercises and other such alternative therapies are useful in getting rid of Dark Circles. Detoxification helps rejuvenate the skin and hence reduce under eye rings. It is recommended that apart from adopting these natural home remedies for Dark Circles under eyes, you should also focus on improving your daily diet by including more iron and vitamin A, vitamin C, vitamin K and vitamin E loaded foods, reducing intake of salt if you are taking it in excess and drinking adequate amount of water. actually my skin is getting dark day by day…nothing suits to my face…my skin is geting so oily….i used dreamflower talc powder but oil dominate it and my skin got dark….my skin colour is light brown but my face is darker than this .what to do…..